Dandelion Radio DJs handpicked tracks for a compilation CD available now on Odd Box Records. 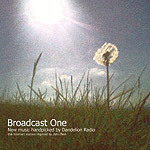 Released on 22nd November 2010, 'Broadcast One' pulls together over an hour of great tunes from various acts, many of which are taken from sessions recorded especially for this station and exclusive to this release. The CD can be ordered for just £6 from Odd Box's website as well as all good real and online record stores. Click the image on the left for a closer look at the artwork, and see its tracklisting below.